You are here: Home / Startup & Funding Tips / Customer Traction: How Much Is “Enough”? 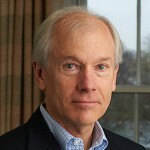 These days, most angel and other early-stage investors have raised the bar. No longer will a snazzy PowerPoint deck, 40-page business plan or business model canvas get an entrepreneur in the door, much less get funded. “So, what is today’s holy grail,” aspiring entrepreneurs ask of their prospective investors? Traction! Customer traction that tells the investor there’s somebody actually out there buying your stuff! “What about market research? My market is huge!” is the all-too-familiar (and naïve) reply. “If only one percent of my market buys my app, we’ll all be rich!” The fact remains that many businesses, including most online and mobile businesses, feel the need to start today – with third-party funding. But there’s another far more hospitable source for the startup funding today’s entrepreneurs need: their customers and the revenue they provide. Once they’ve proven the customer traction is real, the role of the angel or venture capital investor is different, and in their eyes, the business becomes much more attractive. It puts fuel in the tank to help the business grow. Can I really ask entrepreneurs to customer-fund their startups before I come on board? If so, how might they do it? Once they’ve done so, how much customer traction is “enough” to convince me to invest? Service-to-product models (Denmark’s GoViral, Puerto Rico’s Rock Solid Technologies and Microsoft). Whichever of these models an aspiring entrepreneur chooses to follow, sooner or later you’ll find yourself asking the second of our questions: how much customer traction is enough? For Via, an Indian travel industry startup founded in 2006, founder Vinay Gupta was able to sign up 170 travel agents in two months, each of whom gave his new company a $5,000 rolling deposit they could then use to issue airline tickets. Do the math: $850,000 to start and grow the business! What Gupta gave them in exchange was real-time ticketing capability – something they hadn’t had earlier – and better commissions than the airlines were giving them directly. With that level of traction in hand, angel investment and venture capital soon followed. Today Via does half a billion in annual revenue and has become the “Intel Inside” of the Indian travel industry. Claus Moseholm, co-founder of GoViral, a Danish company created in 2003 to harness the then-emerging power of the Internet to deliver advertisers’ video content in viral fashion, saw no need for external investment either. Funding his company’s steady growth with the proceeds of one successful viral video campaign after another, Moseholm and his partners built GoViral into Europe’s leading platform to host and distribute such content. In 2011, GoViral was sold for $97 million, having never taken a single krone or dollar of investment capital. The business had been funded and grown by its customers’ cash. 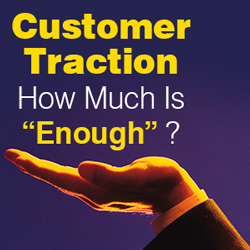 So, how much customer traction is enough? For Moseholm and his partners, it was one customer after another, each of them adding to the body of evidence that Moseholm’s vision for viral online video was on track. For Gupta, it was the first 170 customers who convinced him his vision was on track. There’s no single answer to how many customers, or how much revenue, is “enough.” What really matters to today’s early stage investors is a consistent and repeatable pattern – one customer after another – that proves the case.